Images of primary hippocampal neurons. 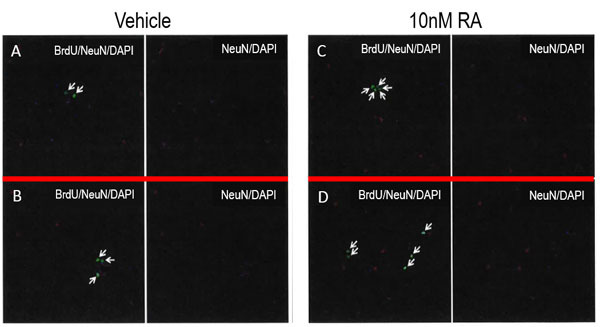 The left panel of each figure shows proliferating neurons marked by BrdU, NeuN and DAPI (white arrows) while the right panel is the total neurons marked by NeuN and DAPI. Vehicle treated cultures are shown in Figures A and B. Figures C and D were treated with Neumentix at 10 nM rosmarinic acid (RA) concentration. 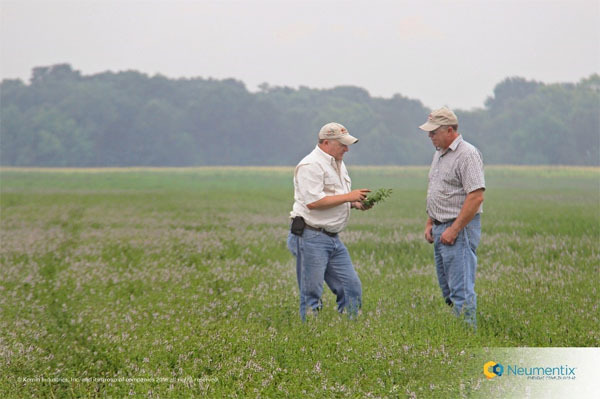 Findings from a recent study show Kemin’s proprietary, spearmint-based cognitive performance ingredient, Neumentix Phenolic Complex K110-42, enhances rates of neurogenesis at physiologically relevant concentrations in rat primary hippocampal cells. The study, “The effects of a proprietary spearmint extract on neurogenesis in rat hippocampal neurons,” was conducted at QPS in Grambach, Austria. Key findings on the novel mechanism of action were presented at the Society for Neuroscience annual meeting, Neuroscience 2016, in San Diego (CA, USA). “This study was designed to test our hypothesis that neurogenesis is a mechanism of action for the clinically observed working memory improvements associated with Neumentix supplementation,” said Laura Wonderling, PhD, Research and Development Director for the Human Nutrition and Health division of Kemin. Primary hippocampal neurons were prepared from Sprague Dawley rats at embryonic day 18. The cells were treated with Neumentix at final concentrations of 10nM, 100nM, 1µM and 100µM rosmarinic acid (RA), vehicle or fibroblast growth factor (FGF) as a positive control, for a total of 48 hours. At the 24-hour mark, Bromdesoxyuridine (BrdU) was used to label proliferating cells. At the 48-hour mark, samples were stained with NeuN to label neurons and BrdU, and then stained with 4’,6-diamidino-2-phenylindole (DAPI) to label DNA. Proliferating neurons (BrdU, NeuN and DAPI positive) and total number of neurons (NeuN and DAPI positive) were determined with digital imaging. Analysis showed the neurons responded differently to various concentrations of Neumentix. Cultures treated in the lowest dose group (10nM RA) displayed statistically significantly greater levels of neurogenesis than vehicle treated cultures. Ageing, stress and/or sleep deprivation are suggested to decrease the rate of neurogenesis in the hippocampus, which may reduce cognitive performance in healthy adults. Neurogenesis is just one of the four proposed mechanisms of action for Neumentix. Research suggests key polyphenolic molecules in Neumentix may act in the brain to reduce oxidative stress, protect neurons in the brain, increase neurotransmitter levels and promote new neural growth. These mechanisms of action may contribute to the clinically observed cognitive performance improvements.